As regular viewers know, I often win uncertified coins on Proxibid, slab some of them via PCGS or NGC, and then consign them on eBay, GreatCollections, or Silver Towne Auctions. I do this for several reasons, keeping only a few won lots for my collection and testing my numismatic skills so that I can write informed articles about the hobby. More often than not, I break even. Occasionally I will score a big win, usually by identifying a rare variety or scoring a rainbow coin slabbed by PCGS. But mostly I engage in buying and selling online to write for Coin Update and Coin World. You can’t report without first-hand experience. Moreover, Coin Update is the only regularly published numismatic venue for reporting on and testing holdering-company standards, as we have done for several years now, explaining how to submit coins to cracking them out for re-submission. To remain in business as a numismatic writer, I have to consign coins, recoup my funds and place bids again for new lots. I also am asked by hobbyists how and where they might want to consign their coins. So a post on consignments is overdue here. 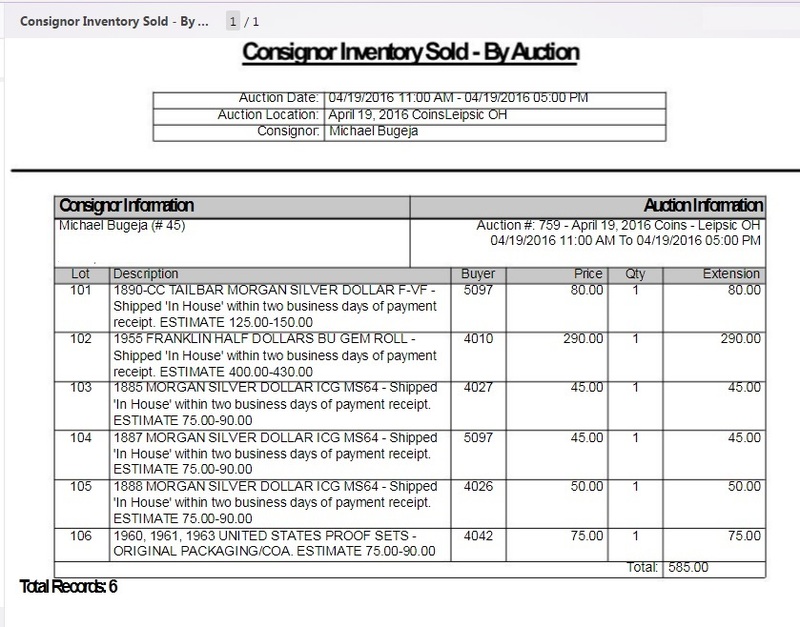 You may have favorite consignment dealers or may sell your own coins online. Please do share those experiences in the comment section below. I used to sell on eBay, but couldn’t justify the time and expense with follow-up correspondents, no pays, and other issues. I identified a consignor who pays promptly and has a good following. So I am willing to pay him 10% plus all fees. Because I consign regularly on Silver Towne, I get to recoup the high bid on each coin with the auction house taking the 17.5% buyer’s fee. GreatCollections takes 10% of winnings in addition to listing fees. I package my coins with cardboard holders and send USPS priority with signature confirmation. I used to insure my coins, but no longer do that because of the expense. (Don’t follow my lead and then blame me if your coins are lost during transit.) I have had a great experience with the Post Office. True, sometimes coins get sent around the country and go missing for a week or more. But USPS has never lost any of my consignments. Again, my experience may differ from yours. To alert my consignors, I send an email to my Silver Towne and eBay sellers telling what coins I will be sending and whether they are graded by a holdering company. If the holdering company provides photos, I share those. I print out two sheets of that email–one for my files and one for the packed coins–so that everyone knows what was sent and received. GreatCollections has a standard consignment sheet for slabbed or raw coins. You fill it out with certification numbers and other data. The sheet has a white page to be included with the submission and a yellow copy page for your files. Coins must be graded by a top holdering company (PCGS, NGC, ANACS, ICG). If you submit raw coins, the company will have them graded at discount before being entered in an auction. You can also get CAC certification, if you wish, again at discount. You can go with a reserve on GreatCollections or allow the company to recommend a starting bid. I almost always go with the later. Don’t have high expectations. People bid on coins in auctions because they want to score bargains. I’ll share some recent consignment sheets so that you can see the results. You can see that the 1928-S Peace dollars sold for $89. It retails for $95. I netted about $78. 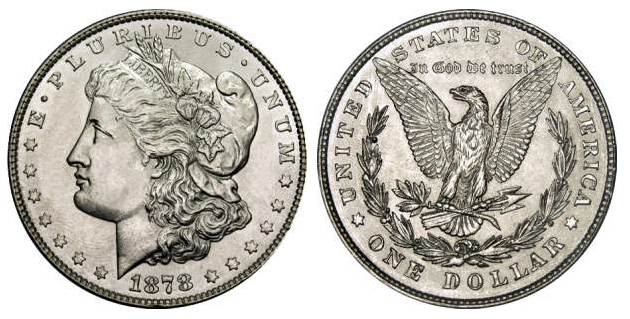 The 1886 Morgan at MS-65 sells retail for about $160. It sold on eBay for $130, and I netted about $115. Keep in mind that I also had to foot the bill for slabbing at PCGS as these were originally raw coins won on Proxibid. So my take is about break-even here. Also, you can see that that 2001 WTC Silver Eagle was returned. So I had to pay fees on that twice when it finally did sell on eBay. Again you can see the disparity between what Silver Towne thought the lot might bring with its high-end estimates and what the lot actually brought. I took a beating on the ICG-graded MS-64 coins, losing about $15 each. I made up for it with the 1955 roll and other raw coins, again barely breaking even. 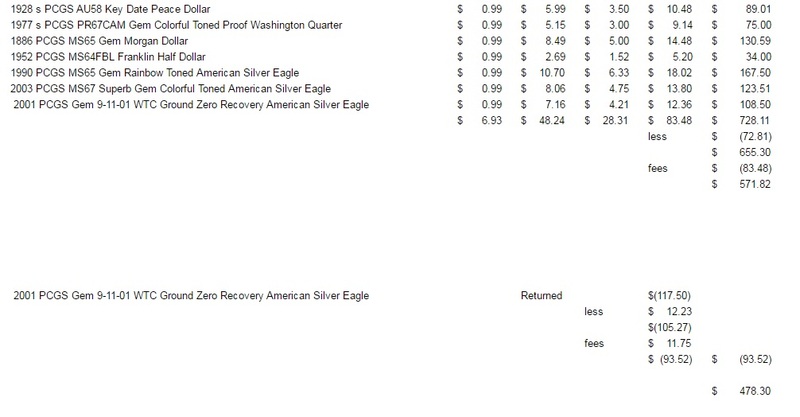 I made $65 profit on the 2006 Silver Eagle, which I submitted to NGC; but lost $75 on the 1998-S Half dollar. So buying and selling online is a break-even kind of business. The difference is a big score every now and then, many of which I have reported here or will in the future. But the process is important. I use my numismatic skills to buy raw coins online, slab them, consign them, and then report to you–part of my journalistic obligation. Don’t forget to share your consignment experiences in the comment section below! I have often consigned to Great Collections. There staff is very accommodating and I would say about 50% of the time the auctions will meet or exceed my minimums. I don’t always use a minimum bid with Great collections, occasionally I start at the $1 minimum. As for GC if you take in consideration the 15% in fees for items $100-$999 (5% Seller and 10%) buyer, I think prices realize good market numbers. Coins valued over $1000 have zero sellers premium and that is huge. I have talked to Heritage a few times regarding consignments, but never pulled the trigger. I believe their pricing and buyers premium are obscene. The customer service at Great collections from IAN and Juliann are just second to none and talking to HA was just a turn off. A tip regarding Heritage, if you have a large consignment, you can get full hammer price if you negotiate and sell unreserved. If you had a big enough consignment, I would try to negotiate 3%-5% of the buyers premium as well (Hammer price +3%-5%). I just like the openness and options at Great Collections. They are a full service auction house that has all the services you need and want. I have sent lots of coins and currency to them when my schedule limits time for doing my own listings on EBay. I have bought coins from Silver Towne, but never consigned and that place is top notch, they really seem to be a good company. Thanks again for your article Mike! Thanks for enriching the conversation, Ryan!